In the European Union there are about 400 types of hearing protectors on the market. Proper selection of hearing protectors is very important because it is only those protectors that are worn during the entire exposure that are suitable to that particular application i.e. working environment and activity. 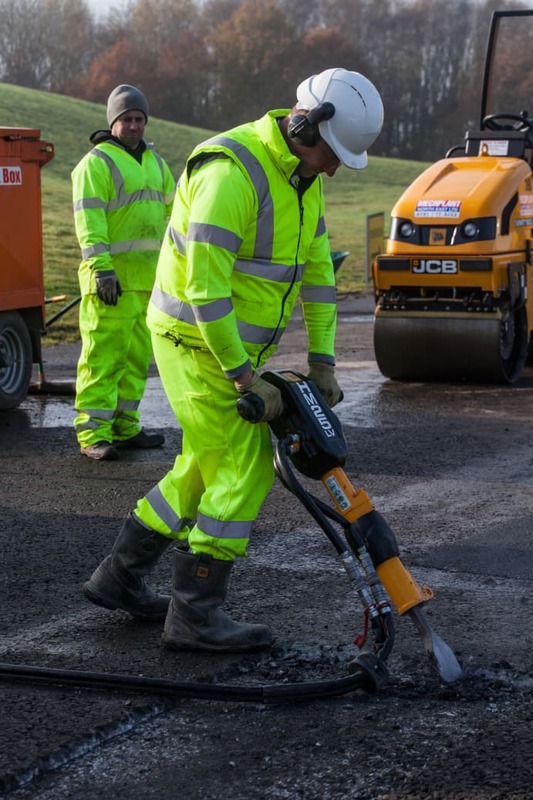 When looking at occupational hearing impairment noise is still a serious problem in industry - despite the huge efforts in the field of noise abatement and hearing protection in the past that have been so effective. For almost all activities a suitable product can be found from the four hundred or so hearing protectors mentioned earlier. Hearing protectors should protect against hazards caused by noise; but all too often the hearing protector itself is a problem to the user. Added difficulty of work and irritability caused by the hearing protector lead to the user's refusal to wear the protector. We hope that this article helps with the proper selection of hearing protectors for your workplace. The Council Directive of 12 May 1986 on the protection of workers from risks related to exposure to noise at work (86/188/EEC) states "...where the daily personal noise exposure of a worker exceeds 90 dB (A) or the maximum value of the unweighted instantaneous sound pressure is greater than 200 Pa, personal ear protectors must be used" and "Where the exposure ...is likely to exceed 85 dB (A) personal ear protectors must be made available to workers." In 1990 this directive was transferred to national regulations by EU member states. The "Directive 2003/10/EC of the European Parliament and the Council of 6 February 2003 on the minimum health and safety requirements regarding the exposure of workers to the risks arising from physical agents (noise)" [http://europa.eu.int/eurlex] decreased the action levels where hearing protectors must be worn from daily noise exposure level (LEX, 8h) 90 dB(A) to 85 dB(A) and from the unweighted instantaneous sound pressure (Ppeak) of 200 Pa to 140 Pa. The lower action level where hearing protectors must be made available to workers was decreased from LEX,8h 85 dB(A) to 80 dB(A) and from Ppeak 200 Pa to 112 Pa. This new directive will have to be transferred to national regulations by 15th February 2006. Cotton-wool ear-plugs with an envelopment of thin foil are disposable and are used at work places with continuous noise. The foil prevents cotton-wool from remaining in the ear canal. It does not give a hermetic seal but does enable pressure compensation and ventilation of the ear canal. 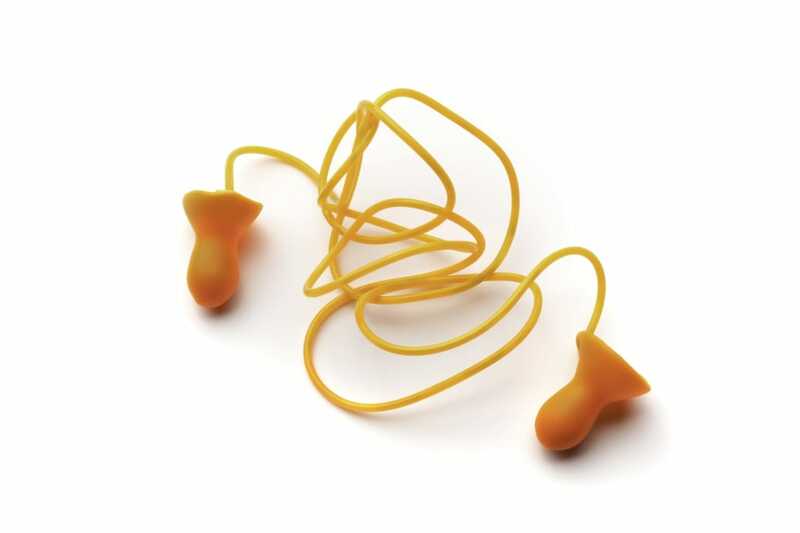 Premoulded ear-plugs with several soft, transverse, circular lamellas can be used 'straight from the box'. They are designed for different ear canal sizes and are usually reusable. They are hygienic and can be kept clean at little expense. Differing ear canal shapes and ear canal transverse sections can sometimes lead to an unsatisfactory fit and discomfort. In such cases alternative hearing protection must be selected. User-formable plugs of polymeric foam are compressed to a thin cylinder; within a few seconds they expand in the ear canal and a good acoustic seal is obtained. The large contact surface can result in a high level of comfort. Ear-plugs of polymeric foam can be disposable or reusable. Banded ear-plugs are ear-plugs that are attached to a band. In most cases they are not suitable for work places with continuous noise. Because of the easy fit they can be used during the inspection of engine-rooms, for example. Banded ear-plugs may not be suitable at welding workplaces because strokes from the welding shield can produce the equivalent of Ppeak = 200 Pa at the user's hearing. Ear-muffs are equipped with a headband, a behind-the-head band or under-the-chin band. Sometimes a flexible headstrap is fitted to each cup which is used to support the cups when the headband is worn behind the head or under the chin. Ear-muffs are suitable for intermittent noise where the ear-muff has to be frequently removed. Some ear-muffs can be mounted onto helmets; the manufacturer has to specify the helmets to which the ear-muff can be mounted. Level-dependant ear-muffs are well suited to intermittent noise: while the surrounding sounds/signals are weak they are transmitted by the electric-acoustic path of the ear-muff without attenuation; if the surrounding sounds/signals are powerful the transmitting path attenuates and therefore protects the hearing of the user effectively up to the specified criterion level. These ear-muffs allow communication during breaks in the noise without removal. 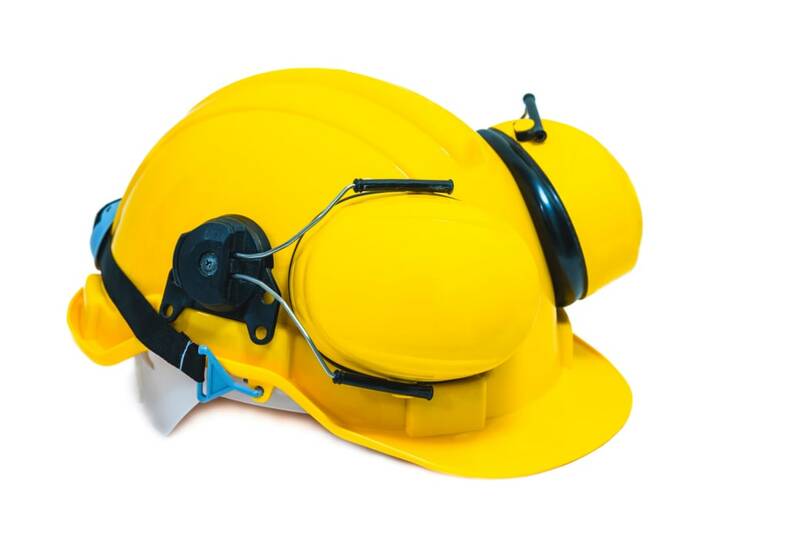 Ear-muffs with integrated radio receivers are suitable for workplaces where monotonous activities are carried out. They increase the user's motivation. These ear-muffs are not suitable if good speech intelligibility and good signal audibility are required. Ear-muffs with integrated radio receivers may be combined with level-dependent function. Active noise reduction (ANR) ear-muffs are hearing protectors that incorporate electro-acoustic devices designed to partially cancel incoming sound to improve further the protection of the wearer. They are suitable for low frequency noise with high sound pressure levels. In industry medium and high frequency noise is much more frequent than low frequency noise and these ear-muffs can be expensive. Communication ear-muffs are used to communicate in noise zones. They are willingly worn because they are necessary to do the job. These ear-muffs are designed for wireless communication or for communication by wire. They are sometimes combined with functions of other special ear-muffs, for example level dependent transmission of surrounding sound. Ear muffs reproducing sound emitted to the ear drum generate additional sound that affects the users hearing and therefore special care has to be taken selecting and using these ear-muffs. When an ear-muff is worn in a hot environment, users might regularly remove the ear-muffs to wipe the sweat from their outer ears. If the ear-muffs are removed for only one minute every half hour, the wearing time is 97 % but the effective exposure to noise is increased by more than 10 dB! Depending on the sound pressure level outside, the ear-muffs and the long-term exposure (over several years) the risk of deterioration of hearing could be increased by up to nine times (according to ISO 1999:1990). In such a hot environment the solution may be to use ear-plugs. Regular short-term removal of the hearing protector within noise zones is very dangerous for hearing! Many things relating to the working environment and activity can cause regular short-term removal, i.e. humidity, informative sounds of the working process, warning signals, speech communication and localisation of noise sources. The next four points are very important if the risk of accidents is increased by wearing a specific hearing protector. This may happen because of a change of the user's sound perception caused by the specific hearing protector so that informative sounds are not recognised by the user. A hearing protector with a better performance should be selected. Repeated short term noise exposure may give rise to the use of ear-muffs or banded ear-plugs because they can be easily removed. 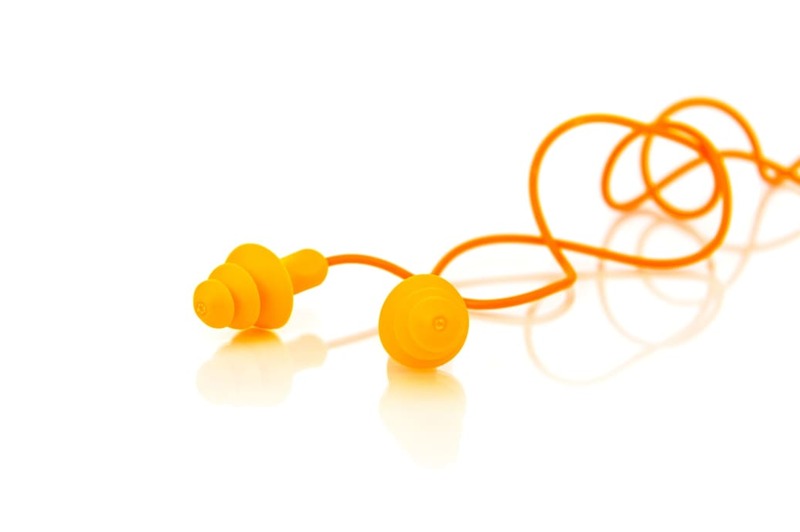 Disposable ear-plugs are preferable for use in dusty environments. Ear-muffs affect the localisation of sound sources because the diffraction of the incoming sound by the pinna is changed and therefore the localisation in the vertical plane is decreased. In such situations ear-plugs perform better. The ability to hear the fire-alarm by all employees has to be guaranteed and in case of any doubt a hearing check according to EN 457 should be carried out. To select hearing protectors according to their sound attenuation the A-weighted equivalent continuous sound pressure level at the workplace has to be determined. EN 458 describes four different methods to determine suitable hearing protectors. If a hearing protector has the correct sound attenuation, the equivalent sound pressure level at the users hearing has to be between '(national) action level minus 15 dB(A)' and '(national) action level' (according to EN 458). Under-protection will create or increase the risk of hearing impairment. Over-protection may lead to a sense of isolation and difficulty perceiving sounds; this will cause the user to remove the hearing protector to increase perception of sounds in certain situations. As a comparison: Sunglasses are selected according to their price, comfort, design, and effectiveness. Nobody would use welding goggles while driving their car because the ratio of efficiency/ price is very high. For safety at work users of hearing protectors need a certain amount of acoustic information from their working environment! At present the comfort of hearing protectors cannot be given an absolute quantitative characteristic. Parameters such as mass, materials and construction, cushion pressure, headband force and adjustibility for ear-muffs, and the ease of fitting and removal for ear-plugs may be relevant. The side arms of spectacles or the retaining harness of a respirator could disturb the seal of an ear-muff against the head and therefore reduce sound attenuation. In such cases ear-plugs would be preferable. Persons who have or have had ear trouble such as irritation of the ear canal, earache, discharges or hearing loss, or are under treatment for any ear disease or skin disorders should be referred for medical advice as to which type of hearing protector is most suitable before hearing protection is issued. In cases where ear canals are too narrow, or a tendency for ear canal inflammations or incompatibility with ear-plugs exist, ear-muffs should be used. An existing hearing impairment may result in additional difficulties in hearing by the use of hearing protectors. In such cases appropriate specialist advice should be sought. Acoustic perception of the environment is much more important for orientation than people realise. Whereas our eyes can only observe the area in front of the head, the ears recognise sound from all directions. Users maintain that hearing protectors may impede or prevent acoustic perception - for example, a forklift truck's acoustic warning signal from behind the user. In fact, hearing protectors can decrease perception of acoustic warning signals and speech intelligibility because the majority of them change the spectral composition of the sound transmitted. Therefore, in areas where signal audibility, speech intelligibility or perception of informative operating sound is important, only hearing protectors with a suitable attenuation value and frequency curve should be used. In cases where perception of the above-mentioned sounds may be impaired, EN 458:1993 recommends giving preference to "hearing protectors having a uniform sound attenuation characteristic over the frequency range". But what does this mean in terms of good signal audibility, speech intelligibility and perception of informative operating sound? For hearing protectors to be used in railway systems and road traffic in Germany well established criteria were layed down by the bodies responsible: only hearing protectors that do not significantly impair the audibility of acoustic warning signals should be used. They have to be pre-selected by special calculations carried out at the BIA applying the criteria mentioned above. In addition they have to be verified by a listening test under the operating conditions at the workplace concerned. A certificate is then issued, based on the above - mentioned test, to be presented during police checks. hearing protectors which were selected in Germany for railway systems and for workers driving vehicles in road traffic should also fulfil the criteria for "signal audibility (general)", "speech intelligibility", and "perception of informative operating sound"
The criterion which best fulfils these two requirements is as follows: If the gradient of the linear regression of mean values of attenuation (obtained according to ISO 4869-1:1990) for 125 Hz up to 4000 Hz is smaller than 3.60 dB per octave the hearing protector is suitable in terms of "signal audibility (general)", "speech intelligibility" and "perception of informative operating sound". Poor fitting of hearing protectors can have a large effect on the obtained sound attenuation: In 1998 the HSE in the UK reported that "...research has shown that the attenuation provided by ear muffs, when used in the work environment, is about 5 dB less than predicted by manufacturers' average attenuation data. For ear plugs a greater variability is found, with differences up to 18 dB observed." This is in line with a German study where differences in the mean of about 13 dB for foam ear-plugs, about 6 to 9 dB for cotton-wool plugs and about 4.5 dB for ear-muffs were found. But in all cases several employees obtained a sound attenuation at their workplaces found in the laboratory. 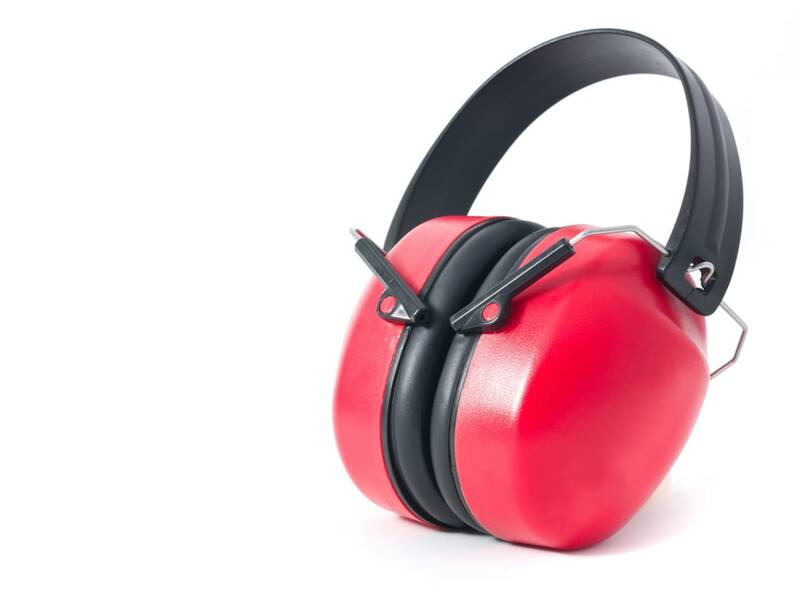 Employees need advice and training in the use of their hearing protection to achieve the expected protection. Custom moulded ear plugs can obtain safe sound attenuation performance because they are individually fitted to users' ears and can only be worn in the correct position. But safe protection is only obtained by accurate production and a final function check at the user's ear. This is the opinion of experts as well as of European manufacturers who have collected valuable experience over the last few decades. In addition it is known that user's ear canals may change size and shape over time. Therefore a regular function check every year or every second year should be part of the manufacturer's after-sales service in order to avoid leakage and loss of protection against the harmful effects of noise. As an example for the total noise exposure when communication devices are worn in noise zones the results of measurements carried out by the BIA on a helicopter pilot's work environment are presented: The sound level of the ambient noise for the pilot in the cockpit of a helicopter was 96 dB(A). The pilot's communication headset had an attenuation of 15 dB(A) for the cockpit sound. That resulted in a remaining component of the cockpit sound effective to the pilot's hearing of 81 dB(A). For the second sound component, which was generated by the communication aspect of the hearing protection, 86 dB(A) was determined. The total sound exposure of the pilot was 87 dB(A). By this simple example it can be shown that for the assessment of the risk of hearing impairment the total sound exposure has to be determined: the sound attenuation of the headset was sufficient for the cockpit noise and the remaining sound component did not exceed the action value of 85 dB(A). But the pilot was actually exposed to 87 dB(A) and the action value of 85 dB(A) was exceeded (see diagram above). To realise proper selection and safe use of communication hearing protectors it is important for the users to know the principles for their safe design. All hearing protectors have to fulfil the same requirements as specified for conventional hearing protectors. For communication ear muffs an agreement was found by the European experts: Communication hearing protectors for entertainment purposes, such as ear muffs with built-in broadcast receivers, must have a sound level limiter to keep the total noise exposure below 85 dB(A) provided that the passive attenuation is sufficient for the noise at the workplace. If a communication hearing protector is not used for entertainment it should also have a limiter for normal applications. The safe operation of the limiter has to be tested by an independent testing body (in Europe a notified body). In exceptional cases, where non-perception or misunderstanding of communication at noisy workplaces results in a significant risk of accidents, the sound level limiter is allowed to limit at levels above 85 dB(A) total noise exposure. Such exceptional cases are, for example, the headsets of helicopter pilots and crew members of sea rescue services. Using information on the maximum allowed operation time at maximum volume per work shift the user can exclude the risk of hearing impairment in these exceptional cases. 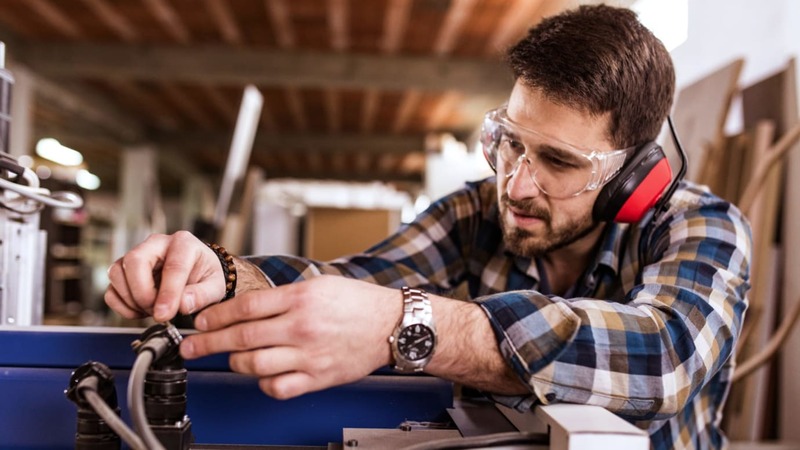 If manufacturers produce communication hearing protectors without sound level limiters, they have to achieve the safe use of their products by other measures to avoid the risk of hearing impairment, i.e. by giving corresponding instructions for use. Dr. Martin Liedtke has been working for the BIA for nine years. He is an expert in "hearing protection and physical exposure data" and is the Certification Officer for Hearing Protection. He holds a doctor's degree in natural science. The Berufsgenossenschaftliches Institut für Arbeitsschutz (BIA) supports the German Berufsgenossenschaften (institutions for statutory accident insurance and prevention) in solving scientific and technical problems relating to safety and health protection at work. The BIA also works on behalf of manufacturers and companies within the framework of testing and certification of quality management systems.